What is a Grading ? The World Shim Jang Taekwondo Academy requires a formal rank promotion test to be conducted by a suitably qualified and officially appointed W.S.T.A Examiner, this is to legitimise and officially document the successful candidate's new rank within the organisation and to ensure that the overall standard within each region remains consistent compared to that of the rest of the academy. In order to relieve stress on the individual, Shimjang Open Days are held quarterly within structured Regions and members can apply for promotion at the Open Day if they have the required authorisation from their Branch Instructor..
Our Shimjang Open Day provides an excellent opportunity for all Students, Parents and members of the public to see the many activities and benefits that our great art has to offer. Open Days are an opportunity for all students to train alongside their peers and are a valuable resource when it comes to a member's growth within the art. Shimjang Open Days are overseen by our Grandmaster or one of his officially appointed Master Examiners, Open Days are attended by all members, students may apply for promotion at the event if their Instructor has assessed them and has deemed them ready to advance to a higher level within the art. Groups of students of the same level are tested together (the higher the rank, the smaller the group). The examiner observes them and determines whether they are proficient in the techniques taught at their levels. The examiner is very experienced and considers each person individually; He can easily distinguish between good or bad technique and is an expert at "sniffing out" bad attitudes. After each Open day the examiner reports back to the W.S.T.A with a grading recommendation for each student that was assessed, the W.S.T.A then will make a final decision based on various aspects of the examiner's report and the students training history as accumulated by the W.ST.A during the students training career. Successful students are usually notified of their new rank either by way of the students personal profile page on this website, within 24hrs of the exam or by their Branch Instructor, at the students next regular training session. Why Do We Have Gradings ? In Shim Jang Taekwondo, in order to earn a higher belt rank each student must take a test, these belt rankings allow the student to focus on short term goals and assist greatly in the students learning process, just like at school these tests are designed to monitor each members progress and make adjustments if necessary. 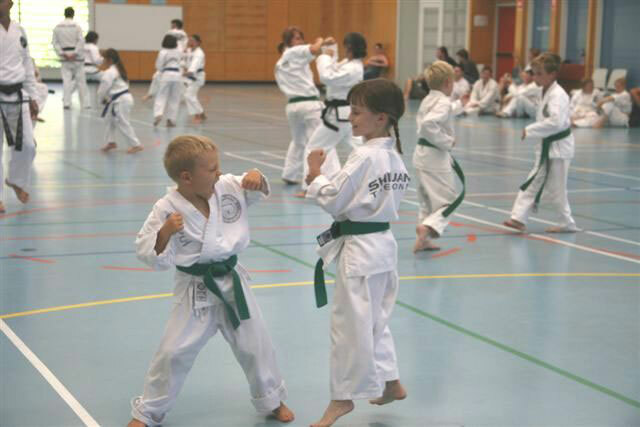 Therefore, just like in any school or learning environment the student needs to focus on their short term goals (next belt level) but not lose track of their long term ambitions (maybe Black belt or Instructor level), it is an important part of the learning process to be continually challenged because students without focus or ambition can become stagnate and their learning and progress will stall. When Should a Student Grade ? As competent instructors we consider it extremely important to advise coloured belt members to focus on applying for promotion at regular intervals, in order for them to continue their growth within the art they are encouraged to prepare well before applying for their next belt level. (continual learning and progression is important when developing the required skills needed to be proficient in any art or profession). The student's performance during the previous term is always taken into account when considering their elevation to the next kup level within the art so it is very important for all students to train both regularly and diligently. Our Instructors are professionals and are required to be in constant communication with the W.S.T.A, each instructor will make recommendations and suggestions to the examiner which can be taken into account when considering a student's promotion. This is all designed to give the student maximum opportunity and a fair, unbiased result. 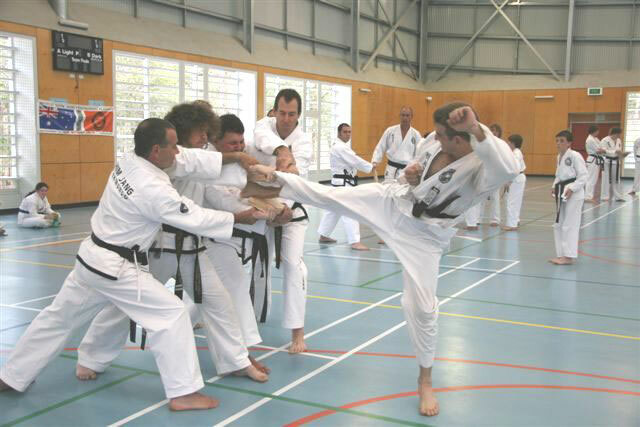 Black Belt and Senior Coloured Belt candidates are usually required to wait much longer between exams, the higher a degree the black belt is testing for, the more time and expertise is required. This prepares the member for the greater responsibilities and the higher expectations that are required of them at the more Senior Black Belt levels. 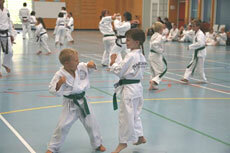 During a grading a Senior Instructor leads the students through the test. Often, the test resembles a shortened, more methodical version of a regular training session. This gives the examiner not just an overall view of the student's progression but also demonstrates what and how the Branch instructor is teaching and how successful they are at doing it. Gradings are an important tool enabling the examiner to constantly monitor the Instructors performance and report it back to the W.S.T.A, this is necessary when the instructor is being considered for higher rank promotion. For an Instructor the pressure is always ON at the grading ! Instructors and Black Belts are constantly scrutinised in order to maintain a strong and consistent standard throughout the organisation, this enables you the student to receive the best possible tuition with maximum opportunity. What Are The Examiners Looking For ? Participants are usually sweaty and tired after a promotion test. In Shim Jang Taekwondo sweating is voluntary but usually those that sweat are the most successful. The examiner appreciates energy and enthusiasm (spirit) and it will definitely help your marks. Skill is naturally extremely important but it isn't the only criteria, Shimjang Taekwondo was founded on the principles of courtesy, respect and good conduct and as such the examiner also takes into consideration the attitude, effort, age and any physical limitations that the applicant may have. Overall, your standard of technique, the courtesy that you show toward others and your attitude must be of a high standard to enable you to succeed within the Shimjang TKD organisation. As coloured belt members you will no doubt sometimes struggle to demonstrate absolute proficiency with a certain technique, (this doesn't necessarily mean that you will fail) as long as you have shown a degree of advancement, perseverance, a winning spirit, and in general, appeared to be a credit to the school your results can still be satisfactory. However, someone who may do all the techniques easily but is rude and unco-operative may not necessarily pass. A good attitude is essential to reach the pinnacle (Black belt) within this organisation. 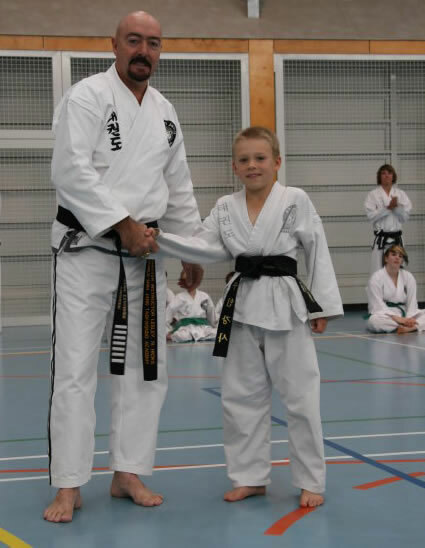 In Shim Jang Taekwondo a student may, on occasion be passed "with reservation" , this means that the student is awarded the higher rank but must work on certain aspects of his/her training before presenting themselves for any subsequent test. In general, a student isn't given two "with reservation" promotions in a row and will not be permitted to grade again unless they have satisfied the examiners reservations. A rank promotion test is less intimidating if you know what to expect, your Branch instructor is an expert at preparing members for promotion, they will usually take you through a grading test rehearsal prior to the exam (this will give you time to brush up on technique and ask your instructor for advice). Feel free to ask the instructor what you'll be expected to do for your test, your Branch instructor is a professional and is eager to see you succeed (remember they are being tested too) Our Branch instructors are very proud men and women with a great passion for teaching the art and they do genuinely want to see their members succeed, they will assist you at every opportunity. For the most part, you need to know how to do the techniques that you've been taught prior to the test and you should be able to demonstrate your pattern with proficiency. What's expected of you at your test will be made quite clear by your Branch Instructor prior to the exam, Just remember to do your best because that is all that is ever expected, your examiner is an experienced professional and knows when you are making an effort. Also, your focus and concentration are judged at a promotion test, to assist with this it is recommended that you get plenty of sleep and have something healthy to eat prior to the exam. In short, prepare for what you know is coming, and ENJOY THE EXPERIENCE ! When you look back on it you will realise that it is actually a lot of fun to be judged by the examiner !